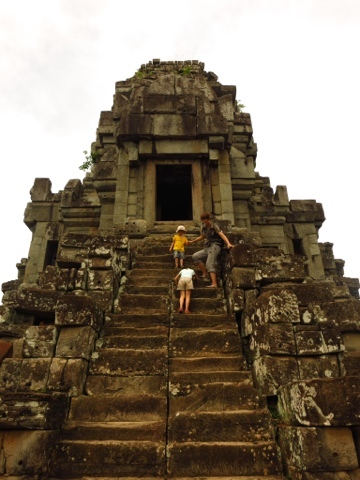 It was not mentioned in our guide book, nor said when we purchased the tickets: children under the age of 12 are not allowed up the steep wooden stairs of the Bankan, in Angkor Wat and the Baphuon, in Angkor Thom. We would have liked to know in advance, as our little ones were very disappointed when they realized they could not climb up. Our wonder backpack, and a courageous dad, saved the day. We managed to convince the guard at the entrance that children are well strapped and very safe in our baby carrier (which is true, by the way). So courageous dad went up and down three times, carrying a load of respectively 11, 15 and 22 kilograms. Thank you so much for that! Stairs in Bankan and Baphuon have steep but solid, modern wooden steps and handrails. Strangely enough, there is absolutely no access restriction to the Ta Keo, which features only the ancient, very steep, irregular and slippery stone steps to its summit. A great but dangerous ascension, exercise caution when undertaking it!